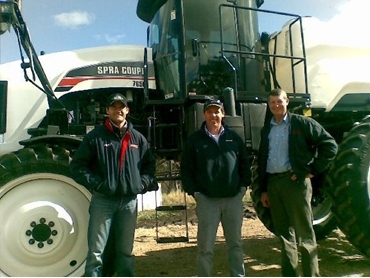 A recently-purchased Croplands 7650 Spra Coupe spraying machine from Croplands Equipment is just getting into stride for Willow Tree-based spray contractors Col and Sally McKenzie. Operating from their base near the northern NSW town of Quirindi on the Liverpool Plains, the business travels up to a 100km radius, servicing a large customer base. The McKenzies also own a smaller, more lightweight machine, a 4660 Croplands Spra Coupe sprayer equipped with a 27m boom, 1600L tank, 93kW (125hp) Perkins engine and adjustable wheel spacing facility. The new addition to their Croplands family, the 7650 spraying machine sports a similar boom and a much larger 2,750L tank with power supplied by a 131kW (175hp) Perkins engine. The 7650 will be earmarked for more dryland cotton-growing duties during the season ahead, as some of the regular clients are going into cotton, according to Col McKenzie. The McKenzies are expecting a lot of herbicide, pesticide and liquid fertiliser work this summer for their self propelled sprayers. Downtime has been reduced with the use of a water truck, an important aspect of spray operations. Additionally, a truck-mounted Hayes and Baguley sprayer ensures the busy contract operation is well-placed to meet the district’s ability to grow both summer and winter crops. The business handles everything from in-crop work to fallow work requiring their machinery to be flexible, easy to operate and reliable. As spray contractors, the McKenzies keep a close eye on the hours each machine undertakes during the course of a busy 12-month spray programme. Their 4660 machine regularly racks up 1,200 hours of work a year, a target that will easily be trumped by the larger 7650 self-propelled spraying machine.